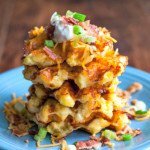 These loaded potato waffles are not only quick and easy to make, they taste delicious. A new way to eat your potatoes! Grease your waffle iron if it calls for it (mine does not) and heat up. In a large bowl beat your egg and then add the mashed potato, cheddar, mozzarella and Parmesan cheese. Mix well. Make your waffles according to manufacturers instruction. I chose to make 6 small waffles. Larger waffles may stick or take more time cooking. When finished, top with bacon, green onions, shredded cheddar and sour cream if using.